Supports healthy bones and joints while reducing the risk of osteoporosis† with plant-sourced, whole-food Calcium in easy-to-swallow tiny tablets. 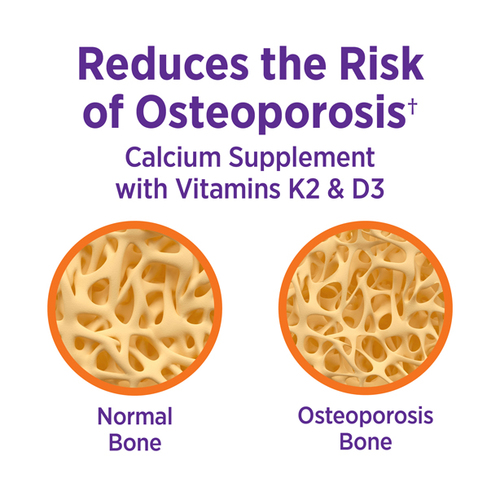 * Learn why Calcium needs Vitamin K2 as a guide. Bone Strength Take Care is also available in Slim Tablets, with a suggested use of three tablets daily. What are Bone Strength Take Care Tiny Tabs? Bone Strength Take Care is complete plant Calcium from Red Marine Algae (Lithothamnion), sustainably harvested from Iceland’s pristine shores. Our Tiny Tabs formula delivers this award-winning whole-food Calcium supplement in an easy-to-swallow, miniature tablet form. What does Bone Strength Take Care plant Calcium do? Bone Strength Take Care is formulated to strengthen bones and help with the absorption of Calcium, support joint flexibility, and help maintain proper artery health. * When you don’t get enough calcium in your bloodstream, calcium is taken from your bones. Bone Strength Take Care supplements your diet with quality plant Calcium for holistic bone health. Other ingredients: Ferment media (organic milled soy, organic Saccharomyces cerevisiae, organic maltodextrin, organic gum acacia, organic alfalfa powder, lactic acid bacteria [Lactobacillus acidophilus, Bifidobacterium bifidum and Lactobacillus rhamnosus], papain [deactivated] and bromelain [deactivated]), organic barley grass, organic gum acacia, maltodextrin, hypromellose, silicon dioxide and sunflower oil. Our bodies understand and seek whole-food sources of nutrition. Learn about our whole-food plant source of Calcium, plus the critical vitamin that actually directs calcium to your bones.